 STRONG AND STABLE: Made from 100% pure Canadian Maple wood, this board can support up to 230 lbs, while still providing a smooth, stable ride.  SIZE MATTERS: Our 38" Long x 9" Wide longboard is the perfect size - large enough for a stable ride, but small enough to easily carry. ✔️ NO MORE WHEEL BITE: The drop through top-mount design enhances stability and eliminates the risk of the dreaded wheel bite.  LOOK NO FURTHER: Not all longboards are the same. Karnage longboards are made with the best materials and engineered to the highest performance. When you ride Karnage, you'll feel the difference. Carve hard or gently cruise on a Karnage Longboard with a drop through top mount design for enhanced stability without the risk of wheel bite. 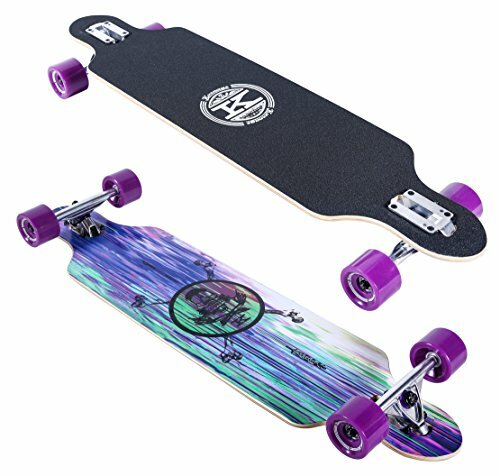 38 inches of pure Canadian maple wood makes riding around the block feel more like surfing the streets. Colorful and solid 70mm x 51mm branded PU wheels with ABEC 7 Bearings.